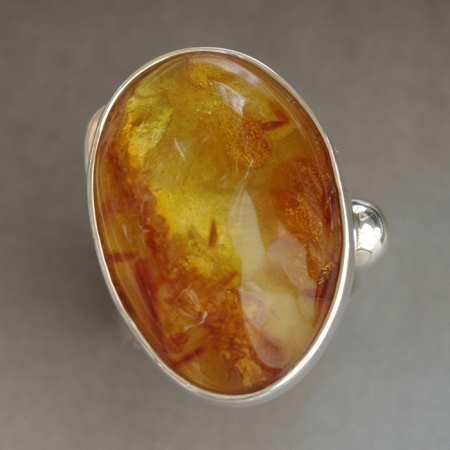 Modernist Jewelry - This is an original sculptural sterling silver ring featuring a oval orange Baltic Amber cabochon, fossilized tree sap. This beautifully handcrafted ring has a wide shank and is adjustable for easy sizing. Handcrafted Sterling Silver ring with a freeform Baltic Amber.This ring is available with other stones and is custom made. It is a beauty and is signed by Aaron. Allow extra half size for wide shank.